Gwadar and Chabahar ports to be connected? Iran has received a request from China to establish a connection between the new port of Gwadar, which Chinese companies are developing in Pakistan, and the strategic Chabahar Port in Iran, currently developed by India, informs Iran Daily. This groundbreaking news has been announced by Managing Director of Chabahar Free Trade Zone Abdolrahim Kordi this week, who further has explained that China was interested in using Chabahar to transit goods from Gwadar to regional and extra-regional destination points. He also said that there was no competition between Iran’s Chabahar and Pakistan’s Gwadar, noting that the two ports could complement each other in terms of market access potentials. However, Kordi noted that the advantages of Chabahar were better than Gwadar in terms of road and rail connection facilities to key transportation points in Central Asia and Europe. Indeed, India, which in May 2016 signed a Memorandum of Understanding with Iran to develop and operate a container terminal at the port of Chabahar, is also constructing a 500-km rail link between Chabahar and Zahedan connecting the port to the existing Iranian rail network, thus providing access to Turkmenistan and northern Afghanistan. Apart from that, India is also involved in building road networks in Afghanistan to connect the cargo routes to Zahedan. According to Iranian media, India plans massive investment in roads and rail construction in the region, which is estimated to cost about USD 15 bln. Iran embarked on the ambitious project to develop the Chabahar port in 2007. The project is planned in four phases to be completed by the 2024 and is expected to enhance a small multipurpose port into a large facility with a total capacity up to 82 mln tons per year. On 03 December 2017, the port’s Phase 1 was officially inaugurated and put into operation in the presence of Iran’s President Dr. Hassan Rouhani. 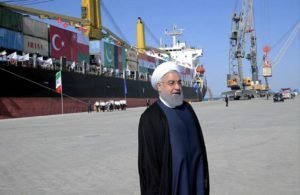 The development of Chabahar was regarded to counterbalance the growing China’s influence in the region and in particular, its progress at Pakistan’s Gwadar Port, where the Hong Kong-based China Overseas Ports Holding Company Ltd signed a 40-years concession agreement in May, 2013 to operate the Gwadar Port and Gwadar Free Zone. The two ports are located on the Gulf of Oman, just 76 nautical miles away from each other. Obviously, now we are witnessing a beginning of a movement towards a closer cooperation between them. Earlier this month, former ambassador of Pakistan to Iran Javid Husain said in an interview to Iranian News Agency that Chabahar and Gwadar Ports could be developed as sister sea ports complementary to each other. “Iran and Pakistan have always been very close to each other, historically, culturally and politically but we need to develop our economic and commercial cooperation on which we have not made much progress as we should have,” he said. “Iranian President Hassan Rouhani has already expressed his willingness to join the CPEC and we should welcome that approach,” he added.